One of our favorite ways to promote healing is through knowledge sharing, which is why we’re thrilled to share with you the work of Dustienne Miller, an inspiring colleague and friend! Dustienne is the creator of a video series that uses yoga postures and breathing techniques to navigate these pelvic health issues. Her first releases relieving pelvic pain and optimizing bladder control were met with such great responses, she just released a NEW wave that targets 4 distinct PF conditions: vulvodynia, interstitial cystitis, endometriosis and constipation. We frequently recommend her first two videos, Relieving Pelvic Pain and Optimizing Bladder Control, because they support the therapy you receive in the clinic through a gentle and effective home program you can do right in your living room. When we heard about Dustienne’s new videos, we talked with her to learn about them and share her insights and the inspiration behind them with you. Sarah: So first off, we’re big fans of your first videos. Let’s start with your inspiration for developing them. What prompted you to create these videos? Emily: Ahh, I see why you call it “Your Pace” yoga! So, who are these videos designed for specifically? Dustienne: These videos are ideal for anyone experiencing pelvic health concerns (both pain and weakness) and the comorbidities associated. For example, one must address constipation when dealing with both pelvic pain and urinary incontinence. Men and women who are seeking strategies for healing pelvic floor dysfunction should also understand the impact of self-care in the healing journey. Empowering my patients is one of my goals. It’s so important for people to have a strategy in place to supplement the clinical work and manage flare-ups. Feeling out of control and unable to help yourself is a common feeling for people with chronic pain, which of course ramps up the fight-or-flight response. This is why I loving having a tool for them to have at home. Emily: It’s so essential for people to be able to take control over their own care. How do you find your videos are different from, say, a yoga class at the local gym? Dustienne: Where some material might be a one-size-fits-all approach, I designed my program to be adaptable. Every individual experiences pain in a different way – both physically and emotionally – and I’ve built in options for viewers to move at their own speed and comfort level. For example, the video can be paused to create more practice time during a section. I always encourage people to listen to their bodies. Also, some physical therapists who I have either taught in my course, Yoga for Pelvic Pain, or colleagues of mine, will talk their patients thru which postures are the most useful or how to modify. Working with a modified program, in the comfort of their own home, can build confidence and rewire brain pain signals to return to the class of their choice. Additionally, I believe that education is helpful to navigating through pain in your body, so I’ve made it a point to explain things anatomically. 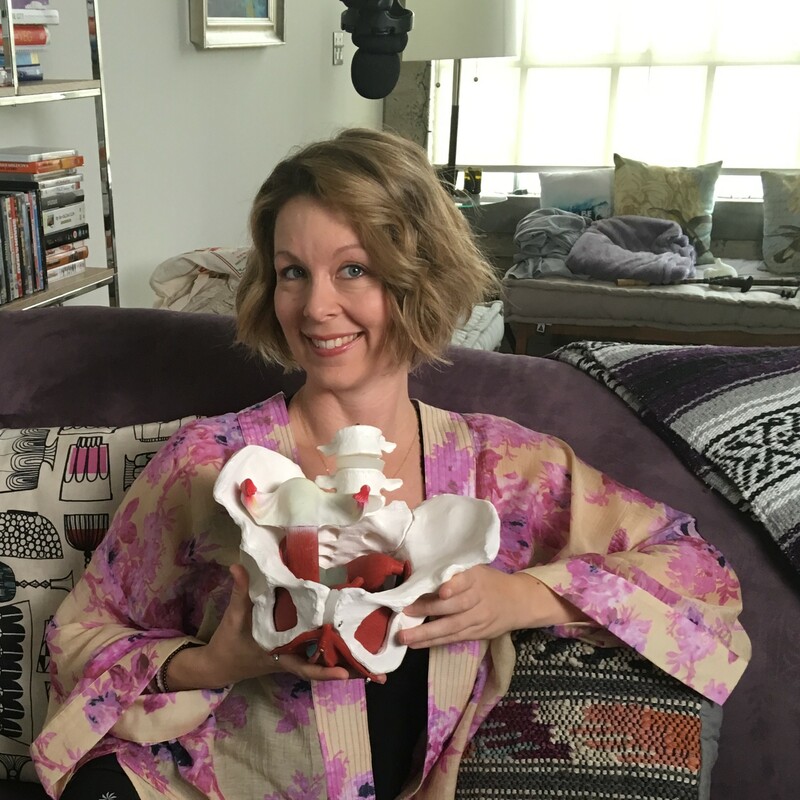 Penelope the Pelvis has a featured role in my video series! Dustienne, Abbie & #PP on set! Sarah: Oh yes, I’ve seen Penelope on your videos and also love her stylish (and clever) Instagram cameos! How do you use yoga to help people who are struggling with different types of pelvic pain? Dustienne: The yoga videos guide people through pain-free, gentle movement that rewires the brain. The increased body awareness and softening that the poses encourage help change pain from being the predominant expected sensation. Getting the brain “on board” with moving freely and without fear is a huge part of healing. Breathing techniques are integrated with the yoga postures, which helps calm the sympathetic nervous system, reduce stiffness and enhance the relationship of the diaphragm to the pelvic floor muscles. Emily: Are there any limitations to using your videos? Dustienne: Like any exercise program, variety of movement is ideal. The body appreciates different movement patterns and planes, which was much of my motivation for the new additions to the video library! I love being able to offer people around the world more options. In regards to the limitations of using yoga home programs, it’s not 100% geared to the person’s specific needs. As a physical therapist I appreciate exercise prescriptions being tailored, but at least the video is a good place to start with guidance by the appropriate provider. Sarah: We are super excited for your new set of videos! People really enjoyed your first series, particularly your calming voice and your clear, easy to follow instructions. What kind of feedback have you received? Dustienne: It’s always really rewarding for me when people say that the videos or guided meditation have been a useful tool for feeling more in control of their lives and pelvic health. I’ve had some wonderful feedback come into my inbox and I appreciate when people take the time to reach out. It really touches me when I receive snail mail from people I’ve never met. Sometimes it can feel like a vacuum. When you teach class you get immediate feedback, so it’s nice to get virtual feedback. Emily: Anything you would improve on or change if you could go back and re-create them? Dustienne: For sure. Like any creative project, there are loads of things I would go back and fix, but that is the challenge of creating a moment in time that gets frozen and is unchangeable. That is why I love the theatre – it’s a moment that will never be able to be reproduced in the same way again. If I say something like “synovial fluid” (my patient just reminded me I said in the first video) and I don’t want to say it the next time I teach a class, I can change it. The permanence of being captured on video is quite intimidating. Emily: That’s so true – and a brilliant relation to your love of theatre. Now just for fun – one last question. If you could do anything in the world, and money was no object, what would you do for one day? Dustienne: I love this question! Just one day? I would arrange for my friends from the Fosse tour to get to NYC and run the show in our old rehearsal room. My friends organized this when I left NYC for CA and it was the most spectacular going away/birthday party a gal could ask for. Then reminisce and laugh over a delicious meal. If I had a little longer, I’d fly me and my best girlfriends to Europe! Sarah: That sounds amazing- especially if Penelope the Pelvis is in your suitcase! Make sure she brings her fabulous wardrobe and let me know if she needs to borrow some shoes! Dustienne: Haha yes! She is always ready for an adventure (and a photo op). We’d like to thank Dustienne for sharing her inspiration, expertise and work with us. We’re huge fans of Dustienne’s work and love being able to share her big heart and soul with you. She is a joy and her new videos will give you the confidence and motivation to reclaim the activities you love. 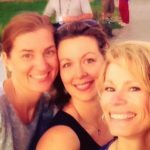 You can find her at www.yourpaceyoga.com, Facebook, Twitter, and Instagram. As practitioners, we all believe passionately in empowering you to heal your body and soul for optimal health. Each of you can be a fierce advocate for your own healing, and we hope to provide the tools to create a joyful, vibrant and fulfilled life! ← POP- Did something fall out down there?